Last year I mentioned earlier evidence suggesting the Younger Dryas was caused by an asteroid impact rather than collapse of the Laurentide ice sheet. 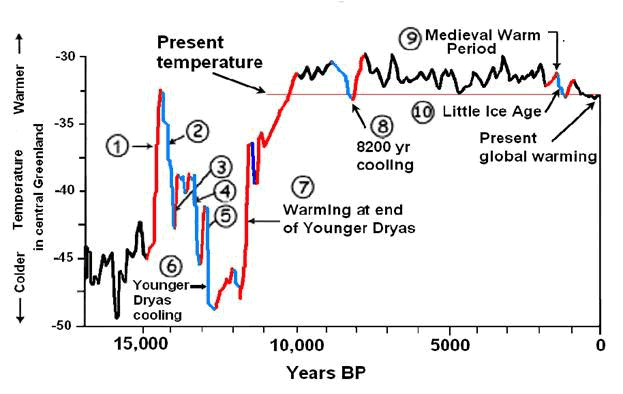 Notice also that that blue dip in the WUWT graph labeled "Little Ice Age" is actually at around 1500 yrs BP! The actual LIA would have been that dip just before the "present global warming", where "present", of course, means sixty years ago. A quick Google image search indicates that it is likely that the WUWT chart was created by Don Easterbrook for a Heartland presentation. That makes sense since mangling the data from Greenland ice cores is Easterbrook's speciality. 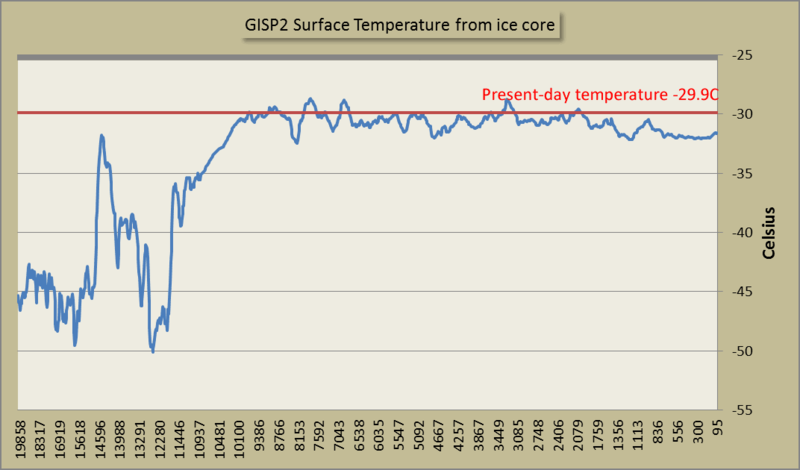 Yes, the graph does appear to be from "GLOBAL COOLING IS HERE! EVIDENCE FOR PREDICTING GLOBAL COOLING FOR THE NEXT THREE DECADES" by Don J. Easterbrook. It appears to have been written for ICECAP. The earliest copy I found in a Word document created October 30, 2008 (same as the ICECAP blog date) and the internal Word author is listed as 'dbunny' which matches Easterbrook's wwu.edu website. In the document the graph is captioned as "Modified from Cuffy and Clow, 1997"
What is it with Watt's always presenting obviously fraudulent graphs? Does he really think that no one will notice his illicit subterfuge? I mean really. Is the Thames river freezing over during winter? But present the Hockey stick graph and they go all crazy. They seem to love being lied to and live in a distorted fantasy world. But what is even more galling is that anyone who doesn't live in their fantasy world has somehow been corrupted by the 'warmistas', and are part of the 'true believer' crowd. I mean, how many times has this website been hijacked by Watties with their bluff and nonsense. It's especially ironic considering the next post here on HotWhopper, in which a psychology PhD students screams "fraud" at just about anything, and the Wattsians nod their heads in agreement. I have a beginners question. Looking at the graphs in fig 1, how reliable is it that the increase in temperature we see today is not just a statistical fluctuation? I mean, looking at the histogram, present time doesn't look very special. Someone must have done a proper statistical analysis and I wonder how likely / unlikely the present time temperature is. A few things about the chart labeled Figure 1 above. The chart itself shows the 1 sigma range (probability, that's statistics). So yes, statistical analysis has been done. 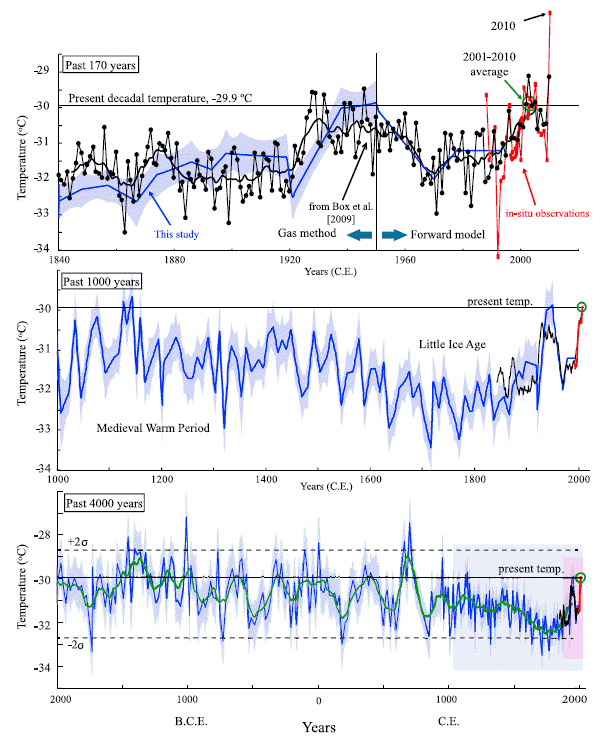 Even if you don't think so, even without reading the statistical analysis (which would be in the paper as well), the 2010 temperature in the top right of the top chart in the chart labelled Fig 1 is clearly way above anything else. It's been getting hot in Greenland, not just the rest of the world. BTW, the Arctic as a whole is warming faster than most other places. The world as a whole is warming very quickly too. We're on track to warm ten times faster than any period in the past 65 million years.